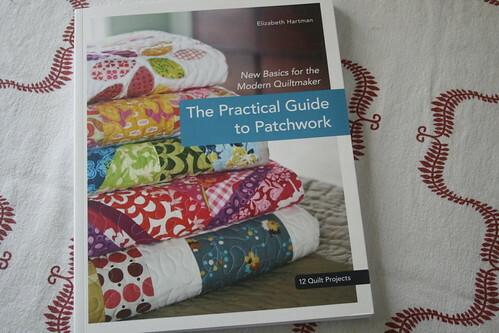 Elizabeth Hartman's Practical Guide to Patchwork is here and ready for you to take home. It details 12 quilt projects (with palette variations for each) and gives step-by-step instructions for techniques like binding and machine quilting. This is a fantastic book for someone who would like to learn how to piece and quilt, but doesn't know where to start. It's also a great book to own for a quilter who needs some fresh inspiration-- still planning on knocking out a couple of quilts for the holidays? Start here. Or pair it with a stack of solid and print fat quarters and you've made your own quilt kit to give away (or keep!). 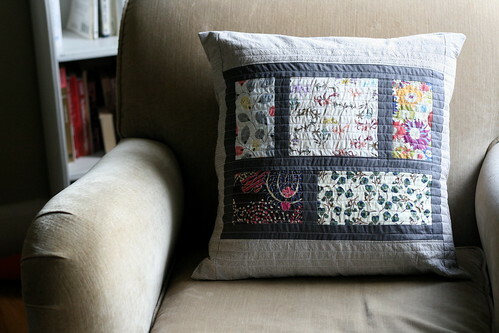 I used a block from the Kitchen Window quilt to sew up a pillow sham last night. The squares are all scraps of Liberty Tana Lawn purchased over the years at Bolt, and the stripe is a cotton/hemp blend that is currently on the shelves. The whole project sewed up between dinner and baths (and not because I am especially quick or wasn't being interrupted!). Elizabeth will be celebrating the release of her book at Modern Domestic this Saturday, November 13th at 4pm. You can come, enter giveaways, chat with Elizabeth and stay for the Portland Modern Quilt Guild's open sewing night (only 10 dollars for the evening!). Apparel Sewers Rejoice! The Bins Are Full.